The hill town of Cortona rises above the Val di Chiana, its white marble and stonework reflecting the sun like some great beacon. This Etruscan town’s origins actually predate recorded history, but its storied existence has long been a focus of commerce, pilgrimage, and war here in central Italy. One of its most popular foundation myths was that the son of Noah, Crano, navigated to that area following the great flood and, finding it fertile and calm, founded his city on the hillside. Cortona was more likely founded by the Umbrians, a tribal group in ancient Italy, but soon taken over and enlarged by the Etruscans. The original town was settled around 3,000 years ago, some three to four hundred years before the founding of Rome. The Etruscans, who predated the Romans, were a devoutly religious people whose wealth stemmed from intercity trade. The Republic of Rome eventually absorbed Cortona itself, and thanks to the Romans roads and highways that were built all over the peninsula, urban centers became linked to one another for the first time. 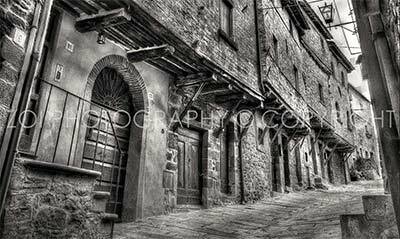 Cortona benefitted immensely from regional trade, and quickly became extremely wealthy. Unfortunately the Roman civilization came crashing down before the city had a chance to develop fully. For the next few centuries, Cortona was subjected to countless raids by barbarian tribes from the north, but with the birth of Christendom it reestablished its prominence in the Italian peninsula. During the Renaissance Cortona quickly became an artistic and cultural center, boasting works of Lucca Signorelli and Fra Angelico. It was also the home of Saint Margaret of Cortona, who followed in the example of St. Francis and his Franciscan Order, yet established her own sainthood through good works and piety. She is credited with the foundation of the hospital of Cortona, and upon her death she was immediately dubbed a saint, although she was not officially canonized until 1728. Today you can see the original walls of the Etruscan city beneath the more modern medieval ones, and you may recognize parts of the town from the recent film Under the Tuscan Sun. 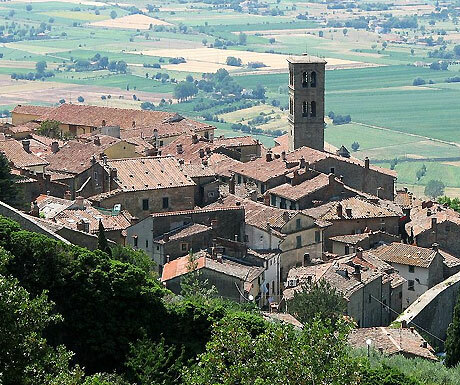 It won’t take long for you to understand why Cortona was chosen as the setting for the movie; its inhabitants exhibit the same warmth that Tuscans are known for, and are extremely charming to boot. Evenings in the city can be spent exploring the quiet streets or taking in a concerto in the main piazza. During the summertime Cortona offers an extensive schedule of musical productions for visitors and locals alike to enjoy. There is also the home of our friend Alessandra to visit, where she hosts a fantastic cooking class. You can learn traditional Tuscan cuisine as well as all about the culture and history behind many of Tuscany’s most famous dishes. Add some fine wine to this experience and you are sure to be captivated by this magical and historic place.